My mother instilled within me from an early age the importance of impeccably-wrapped gifts. 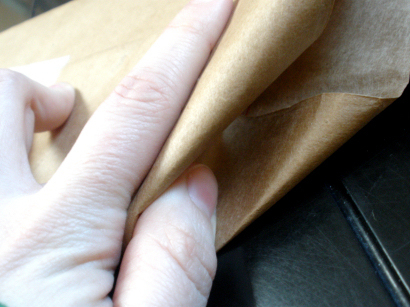 Thick brown grocery bags are not the easiest medium to work with. Even so, I wrangled each sheet into submission and tried my best to make tight corners and straight seams. 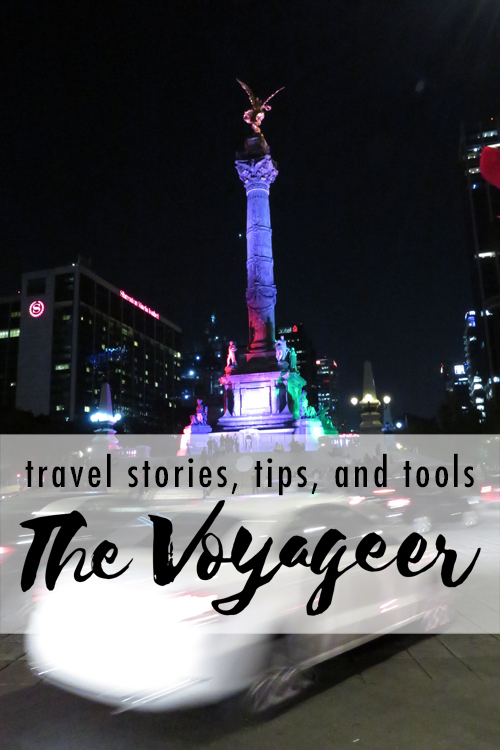 Now YOU can too! Please excuse the apparent one-handed wrapping job. Without my trusty photographer (who is at work) I had to wrap a little, snap a little [photo, that is]. Oh, come on, you thought that last line was clever. 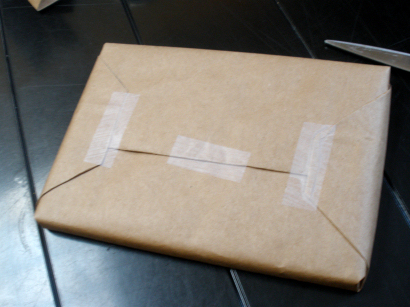 Anyway, here is my attempt at a how-to wrap guide (the way my mommy taught me how to!) after the click! And please, forgive my pasty white hands. The camera is not kind to my skin tone. First I start with the object and an appropriate amount of paper. 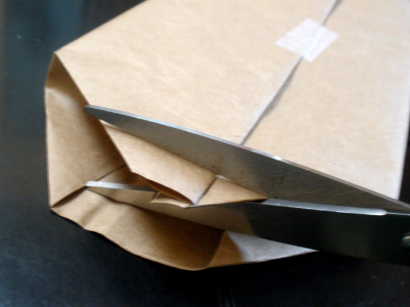 The amount of paper is important to reduce bulk and keep it crisp. Second, I fold the piece that will be on top an inch or two, to hide ragged edges. 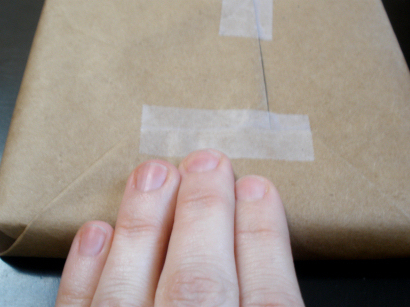 Wrap around the gift and secure with tape. At the ends, tuck the small edge in (make sure all edges and creases are crisp) so that you are left with a triangle on top and on bottom. I always clip the part with the fold, so that there's less bulky paper to deal with. This helps it keep it hidden in the next step. Tuck the part you just clipped down, and pull the bottom part up and over it. Make sure to crease paper at all edges and folds. Secure with tape. Repeat the last step with the other end. 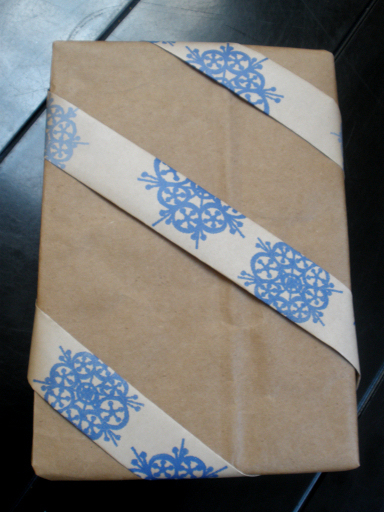 Now, the bottom of your package should look like this! 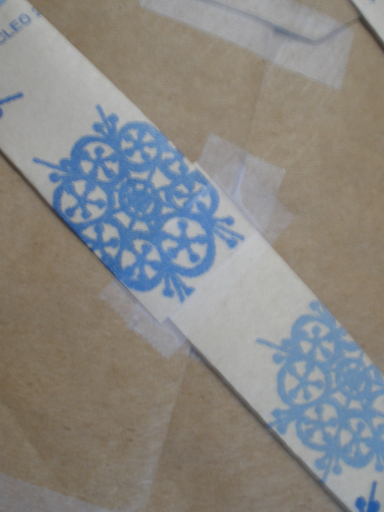 Martha Stewart uses double side tape (so it's invisible) but I need something stronger for this grocery bag paper. Extra decorations should be secured (tape, glue, whatever) on the bottom so the top stays pretty. This is a folded scrap of my other wrapping paper I turned into a ribbon. The top of the present should be clean and beautiful! I ended up adding some twine to this one, which is where I attached the nametag.